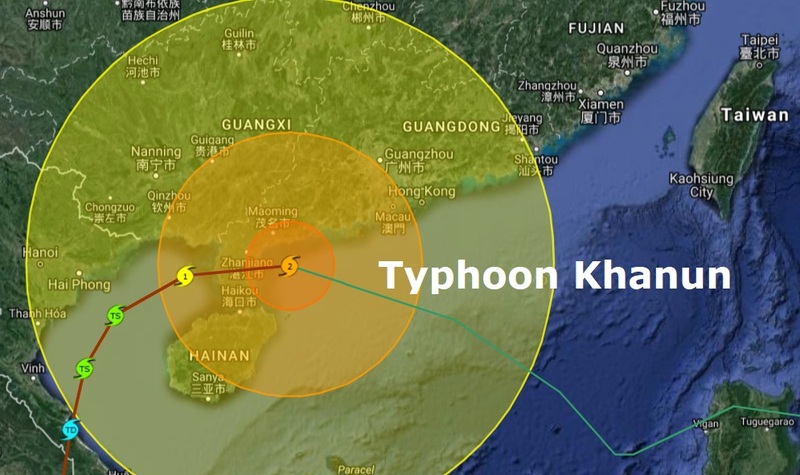 The Big Wobble: Typhoon Khanun is Hong Kong's seventh typhoon of the year as it heads south for North Vietnam putting lives and property in extreme danger. Typhoon Khanun is Hong Kong's seventh typhoon of the year as it heads south for North Vietnam putting lives and property in extreme danger. Spare a thought for Hong Kong, Typhoon Khanun is the city’s seventh typhoon of the year as it made landfall this morning causing flight disruptions and chaos to airport-bound traffic. According to South China Morning Post. Typhoon Khanun is now heading for North Vietnam. While Khanun will likely continue to weaken before moving into northern Vietnam, it threatens to exacerbate the flood disaster that unfolded earlier this week in the wake of Tropical Depression 23W. A disaster could unfold for northern Vietnam with more excessive rainfall over the same areas that were inundated by the recent depression and could trigger new flooding and mudslides, putting more lives and property in extreme danger. According to AccuWeather.com Flooding and landslides have killed dozens of people in northern and central Vietnam with more than 300 homes collapsed. More than 34,000 homes were either submerged or damaged. Rivers that are already putting a strain on area dams are expected to further rise when Khanun moves through the region. Raging water or mudslides could also damage roads and bridges.